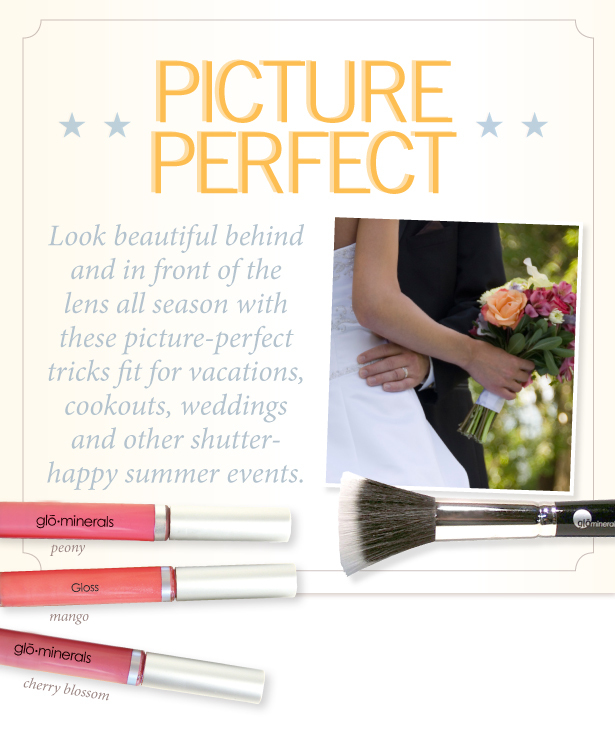 Look beautiful behind and in front of the lens all season with these picture-perfect tricks fit for vacations, cookouts, weddings and other shutter-happy summer events. Golden Hour: The best time for photos is the hour just after sunrise or just before sunset - they're called the golden hour for a reason! Wise Wardrobe: Wear flattering clothes that complement your skin tone and are neither too tight nor too loose - either extreme will result in photos that don't show your best side. Give a Little Lip: Apply Gloss just before a photo to add a pop of healthy color and pretty shine to lips - it highlights your smile! Laugh Out Loud: When you smile, chuckle and even say "Ha ha" you will notice a difference in how genuine your smile looks in photos. Body Language: Stand up straight with shoulders relaxed and elongate your neck to prevent the dreaded double chin effect. Brighten Up: Summer is bright, natural beauty. Light up your face with Sheer Tint Illuminator and get a professional to match your foundation for flawless summer skin. Plus a Summer Mix Tip: Swirl a bit of Protective Liquid Foundation - Satin II with a spritz of Moist Hydration Mist and Sheer Tint Illuminator using the Texture Brush then brush ont skin. It gives a gorgeous airbrush effect - and it's a new trick we're obsessed with!